Original plein-air small landscape painting. 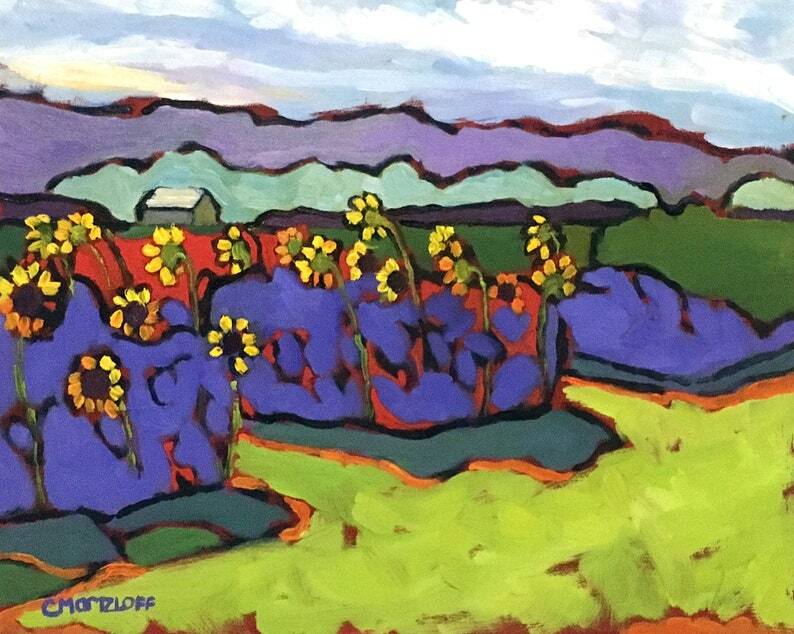 This small painting captures an early fall moment among a field of yellow sunflowers. I was inspired by the flowers facing away from me and the glimpse of a small barn in the distance. There were rich shadows in indigo blue set against vibrant yellows and greens that also peaked my interest. The painting is composed of simple shapes and lines to highlight aspects of the landscape that I found most compelling. There is an abstract nature to the artwork that invites the viewer into the scene in a more emotional manner. The painting does have visible brushwork and was painted on a panel that is signed and ready to frame. This was painted on site a Holland Ridge Farms in New Jersey during their sunflower festival. If you have any questions on this painting or others within my shop, please convo me! WWW.RENDEREDIMPRESSIONS.COM for more information and selection.